Rasberry Pest Professionals are top professionals on rodent control. Rodents want to enter the home or business to get shelter from the cold or hot weather. Being warm blooded animals, if you are seeking shelter from the weather these animals are probably doing the same. The first step in eliminating rodents is to find out what type of rodent you have. This is needed in order to find the right treatment technique to use. 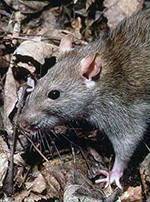 Controlling Rats usually requires baiting and finding their access points. Once the Rats have been eliminated then sealing off the points of entry is necessary for long term results. Rats are nocturnal and you will probably hear them mainly at night. Unlike rats, it is very difficult to find the entry points for mice. Normally bait and traps are required to control mice in a timely manner. Mice are nocturnal and you will probably hear them mainly at night. Trapping or other techniques are used in controlling raccoons. Finding their entry point is usually fairly easy. Raccoons entry points are usually large and they can be very destructive. Raccoons are nocturnal and you will probably hear them mainly at night. When these animals are in the attic, there will be no doubt that there is a large animal walking on your ceiling. Squirrels, opossums, and other animals may get into your living space. For information and advice please call our office. Call us for rodent pest control.... 281-332-3284.